Opportunities delayed: INGER @ 40 | A balanced diet . . . I don’t expect that the International Network for the Genetic Evaluation of Rice (INGER) will be familiar to many readers of this blog. Nor will the International Rice Testing Program (IRTP), the forerunner of INGER from 1975 to 1989. INGER demonstration plots – the diversity among these rice varieties is striking. INGER is undoubtedly a rice germplasm exchange and testing network success story. You only have to look at the statistics on varieties tested, the number of testing sites, the collaboration between scientists, etc. to see the scope of what IRTP-INGER has achieved over its lifetime. More importantly, however, is the significant number of rice varieties that have been selected from INGER trials and released in one country even though they were bred in another. It’s also interesting to note how many varieties from Sri Lanka have been adopted in other countries through INGER. Many examples are highlighted in a recent article, INGER@40—and the crossroads, that just appeared in IRRI’s flagship magazine riceTODAY. Not only can the value of rice germplasm exchange be quantified in terms of millions (probably billions) of dollars of increased productivity of rice agriculture, but also think about how new varieties have benefited rice farmers and those who eat rice every day (or several times a day). When IRTP-INGER was founded in 1975, it was fortunate to receive substantial funding each year from the United Nations Development Program (UNDP). That funding lasted for 20 years, but was both IRTP-INGER’s boon and its bane. By the mid-1990s when UNDP support came to an end, it was always going to be difficult to find a donor to step in and provide long-term funding at the same level. And believe me, it was a struggle to persuade donors to emulate UNDP. Because the INGER model presented to donors was the one that UNDP has decided to discontinue funding, it was analogous to trying to sell a second-hand car rather than a brand new model with all the extras. We needed some bridging funds, and I was heavily involved in persuading a couple of IRRI’s donors, from Germany and Switzerland, to stump up USD1.5 million following review of a project proposal and a presentation to donors in Washington, DC in October 1994. However, the long-term funding situation was not resolved. Earlier that year I had made a review of INGER in Africa for the Directors General of IRRI and Africa Rice (WARDA as it then was), Drs Klaus Lampe and Eugene Terry, and made my first visit to Africa Rice headquarters in Bouaké, Ivory Coast. 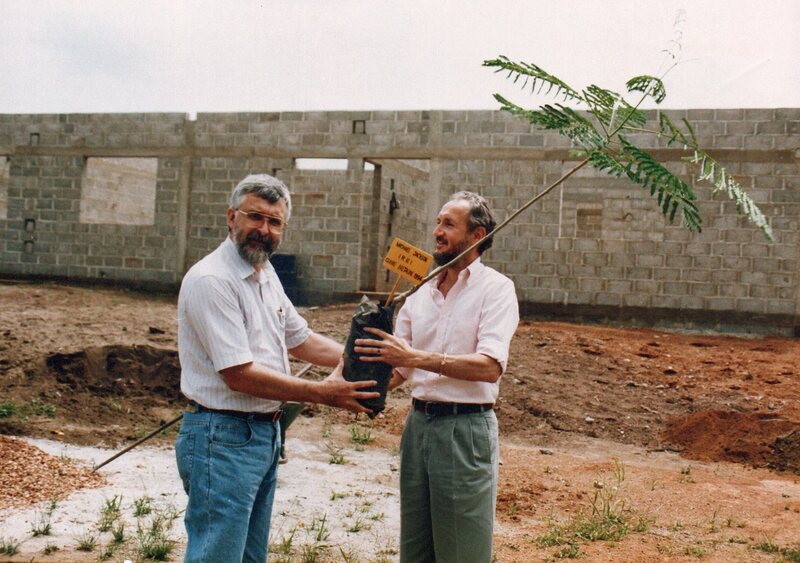 In the phot below, I planted a tree at the Bouaké site. I wonder if it’s still there. The other person in the photo is economist Dr Peter Matlon, who was DDG-Research in 1994, and later became Chair of the Board of Trustees. In my opinion, INGER could—and should—have been more. According to the riceTODAY article, INGER is today, 40 years after it was founded, at ‘the crossroads’. But it was already at a crossroads almost 25 years ago when it became clear that UNDP support would end. Opportunities were not seized then, I contend, to bring about radical and efficient changes to the management and operations of this important rice germplasm network, but without losing any of the benefits of the previous 20 years. I also believed it should be possible to add even more scientific value. Did we miss an opportunity? But first, a little background, as it’s relevant to what subsequently took place—or rather didn’t. In 1990 IRRI Management made the decision to reorganize the institute’s rice germplasm conservation and exchange activities. The Genetic Resources Center (GRC) was established bringing together INGER, the International Rice Germplasm Center (IRGC, the genebank), and the Seed Health Unit (SHU) into a single organizational unit, but with these three retaining their identities and functions. Recruitment for a founding head of GRC began in September 1990, and I was appointed from 1 July 1991. By then a decision had already been made (wisely in my opinion) to keep the SHU as an separate unit, given its important role of ‘policing’ the health of incoming rice germplasm and that being exported to other rice programs around the globe, under the auspices of the Plant Quarantine Service of the Philippines. We quickly lost the name International Rice Germplasm Center (how was it possible to have a center within a center? ), and on my appointment GRC comprised the International Rice Genebank and INGER. While I was given overall responsibility for all GRC facilities and staff, the head of INGER (then Dr DV Seshu) ran the network on a daily basis, as I did the International Rice Genebank. And it was through my role in GRC that I became involved in discussions about the future of INGER. I had joined IRRI from The University of Birmingham, where I had been a member of the Plant Genetics Group. Birmingham had a fine reputation for quantitative genetics, and my colleagues there had a lot of experience in running germplasm evaluation trials. Actually they had been trialing populations of tobacco for decades to understand the nature of quantitative variation in their experimental lines. With my colleagues Brian Ford-Lloyd and Martin Parry I’d also spearheaded discussions (controversial at the time) about climate change and how genetic resources could contribute towards adaptation. I had proposed a system of germplasm testing in Europe. So with this dual focus, I felt that with a re-jigging of the INGER trials it would be possible to increase the data value of a smaller number of precision trials without losing the valuable germplasm testing and selection opportunities for breeders. There’s considerable evidence to demonstrate that it’s not necessary to run hundreds of trials to achieve a thorough evaluation and analysis of genotypes and their performance in different environments. Two trials are better than one, of course, four better than two. And twenty better than ten. More than twenty and the ‘Law of Diminishing Returns’ apparently kicks in, so my Birmingham quantitative genetics colleagues advised me. In a nutshell, my proposal was to identify key sites across a range of rice-growing environments, characterize them thoroughly, keep careful weather data at each site, and trial germplasm there using different experimental designs as appropriate in order to develop a critical analysis of germplasm performance across environments, or genotype x environment interaction. With quality data being collated for analysis by IRRI—and rapidly—it would then be possible to predict and propose a smaller set of varieties to be tested more widely by breeders round the globe at their own sites. They would no longer be ‘required’ to test a large number of germplasm lines, most of which would not be suitable for their conditions in any case. Nor would INGER be ‘burdened’ with the costly distribution of a large amount of seeds in multiple trials annually. During my travels many breeders had told me, off the record so-to-speak, that they found the large trials a burden. And as early as 1992 I’d had discussions with a post-doctoral fellow at IRRI (I can’t remember his name) how we might use geographical information systems (GIS), or perhaps I should say proto-GIS, to enhance and rationalize germplasm testing across multiple sites. Just imagine what we could achieve today in terms of germplasm testing. There are now sophisticated GIS applications, satellite imagery, as well as all the molecular approaches to characterize germplasm lines even before they’ve been tested in the field. As early as 1995 we had shown that molecular markers could be used to predict the performance of germplasm. Think what might be possible today with the application of various ‘omics’ technologies*. I don’t think that I’ve done particular justice to the ideas I raised almost a quarter of a century ago. Nor am I suggesting that they are necessarily the only or appropriate ones. But different ideas did—and still do—need to be put on the table. Unfortunately, at that time institutional politics, vested interests and, I have to say, some unimaginative leadership of the network for at least a decade or so after Dr Seshu retired, did not permit consideration in any meaningful way, let alone introduction, of a new strategy and approach for INGER. In that sense I feel it was an opportunity (or opportunities) delayed. By now we could have had almost 25 years of solid and reliable data for G x E analyses that would stand up to critical scientific scrutiny. I just hope that when the time comes for further discussions about the future of INGER, as indicated in the riceTODAY article, that the new opportunities are not squandered. The network and its benefits are too important. But the network has to be fit for purpose. It has to demonstrate its relevance and adopt new approaches. Only then can it contribute more effectively to the ‘Big Data’ approach highlighted in a recent Thomson Reuters web publication. * My former IRRI colleague Ken McNally wrote an excellent chapter for our Genetic Resources and Climate Change book in 2014. My friend Rodomiro Ortiz has just published a book on plant breeding and ‘omics’. This entry was posted in IRRI, On my mind . . ., Science and tagged germplasm testing, INGER. IRTP, rice varieties.